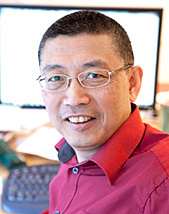 Luping Tang is a Professor at the Division of Building Technology, and supervises the research group Building Materials, at Chalmers. As a Professor of Building Materials, he focuses his research on cementitious materials and products, with a focus on durability of materials. The goal is to create knowledge, methods and models for material manufacturers, construction engineers and managers who can design, build and manage expensive buildings and infrastructure to maintain the desired functionality during the designed lifetime. Tang's method Rapid Chloride Migration (RCM) has received worldwide use. Possible pitfall in sample preparation for SEM analysis - A discussion of the paper “Fabrication of polycarboxylate/graphene oxide nanosheet composites by copolymerization for reinforcing and toughening cement composites” by Lv et al. International RILEM Workshop on Performance Based Evaluation and Indicators for Concrete Durability, 19-21 March 2006, Madrid. There might be more projects where Luping Tang participates, but you have to be logged in as a Chalmers employee to see them.